I got so excited thinking about how much better I was going to see after cataract surgery, I completely forgot to ask about the length of time and inconveniences of recovery. My timing could have been better, perhaps, like after fall migration, not during. As it stands right now, my current prescription does not work with my right eye, so in between trying to figure out which eye to read with, I have been working on eye-hand coordination with my left eye behind the camera lens and my right index finger on the shutter button. I keep imagining headaches but I’m too lazy to indulge. Donacobius – If you saw my post from the Colombian Andes last year this bird might look familiar. Luckily these pictures were all taken the last day and a half in the Ecuadoran Amazon when both eyes were working about the same. This completes my recap of the Amazon trip. On the way to the Wire-Tailed Manakin, accessed by walking a boardwalk trail directly adjacent to our rooms at Sacha Lodge, we stopped by Mariposa Lodge, a butterfly house where butterflies are actually raised and shipped to butterfly enclosures all over the world. Below are a few I was able to photograph. 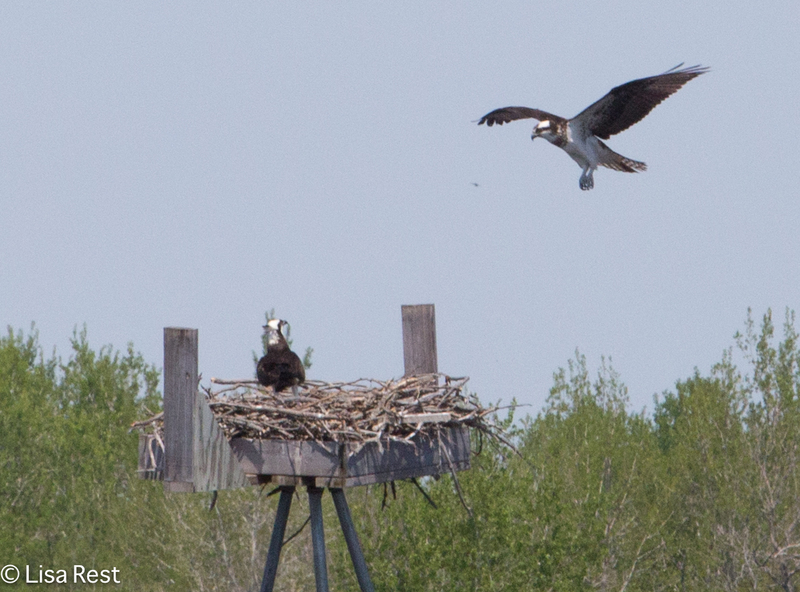 From the canoe, an Osprey and some Large-Billed Terns. Also from the canoe, this Hoatzin, looking simply fabulous. 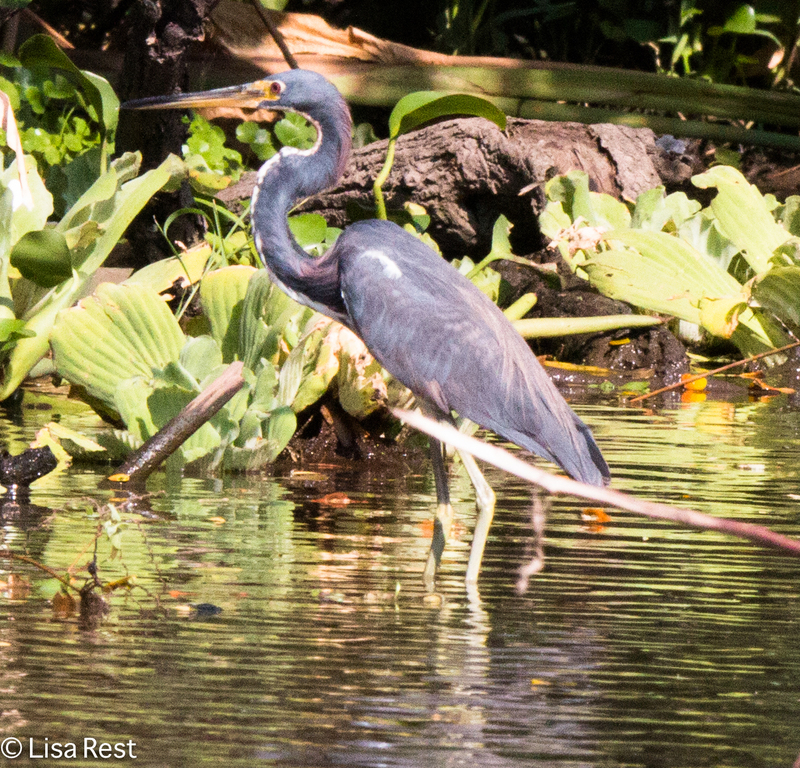 Here are a few pictures from the boat down the Napo River as we were leaving the lodge. I was saddened by the fact that this once pristine wilderness is now, of course, exploited for oil. There aren’t too many places left on earth that have not been touched by drilling or fracking, I’m afraid. I was encouraged to hear the Amazonian Ecuadorans protesting further drilling at Yasuni National Park and I hope they succeed in stopping it. Ecuadorans have also joined the Standing Rock Sioux in North Dakota to protest the Dakota Access Pipeline and protect the Missouri River. The world is shrinking rapidly and we are all in this mess together. On our last morning, we saw our last Trogon, the Collared Trogon below on the left, and after trying to find a White-Chinned Jacamar all week we finally did see one, on the right. Below, an Oriole Blackbird and a Grayish Saltator. And two Blue-Grey Tanagers. There were two of the Wire-Tailed Manakins, this is likely just another picture of the same one. They weren’t displaying or dancing but they’re still awfully cute. I think I just found a new profile picture for Facebook. I’ll be back as soon as I can, in between eye drops. 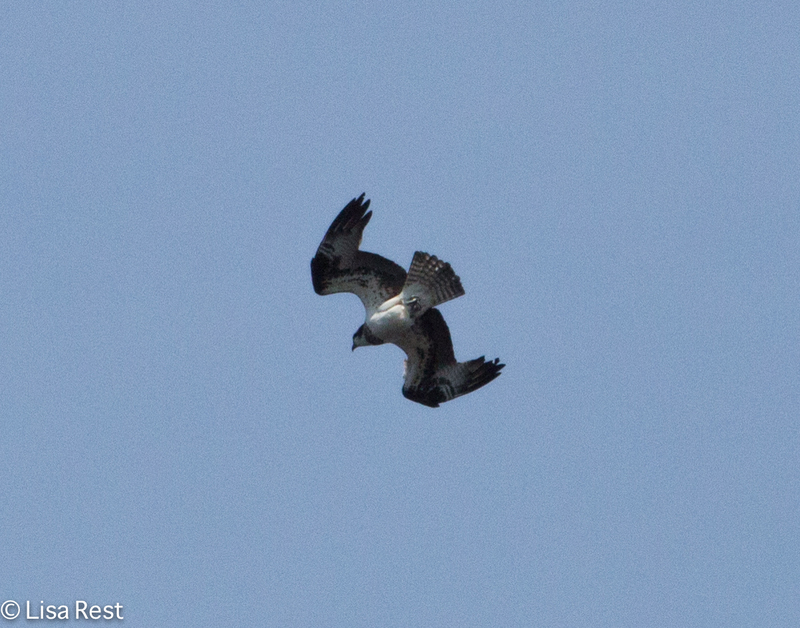 This post will feature flying birds as I continue to soar through pictures from the Memorial Day Weekend. It’s been a busy week at work and the only antidote is swimming, which means I have spent less time sitting with the laptop. On the Chicago Ornithological Society (COS) Kirtland’s Warbler Memorial Day trip, the second day we spent the morning at Tuttle Marsh. 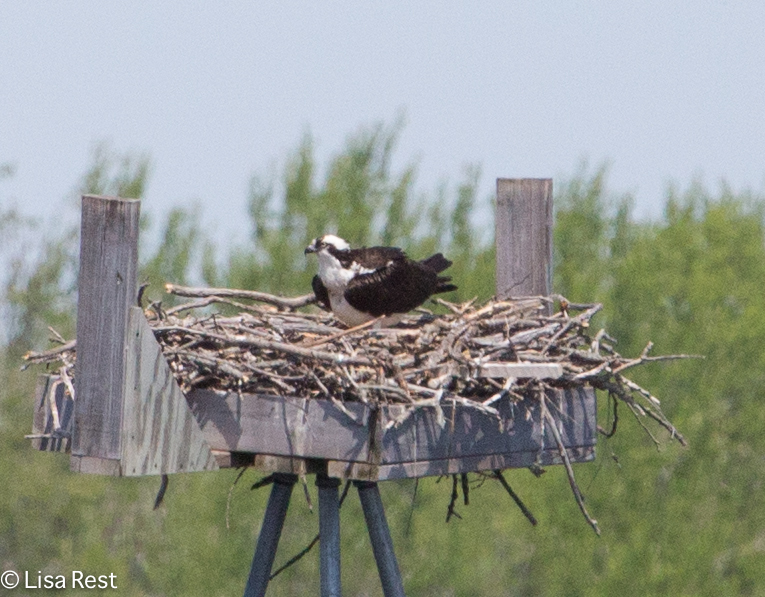 Above is a picture of one of the Ospreys that nests there. 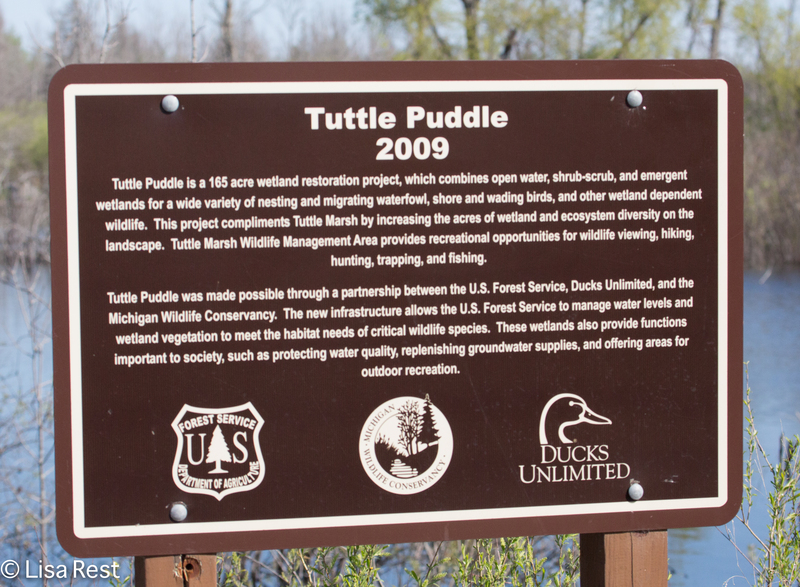 Below is a sign describing the wetland restoration project at Tuttle Marsh. Click on any of the pictures to enlarge the view. I saw my first American Bittern at Tuttle Marsh last year, in the reeds. 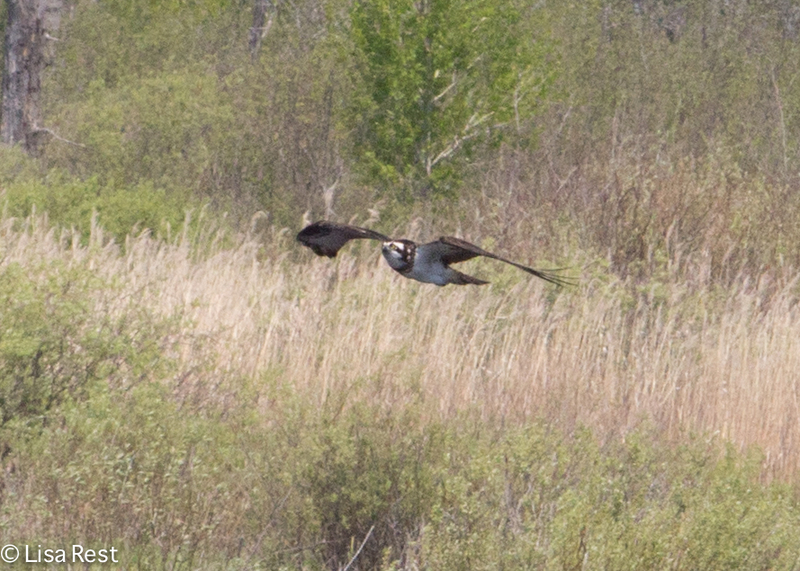 This year, we had two flying across the marsh. Above is one of them. 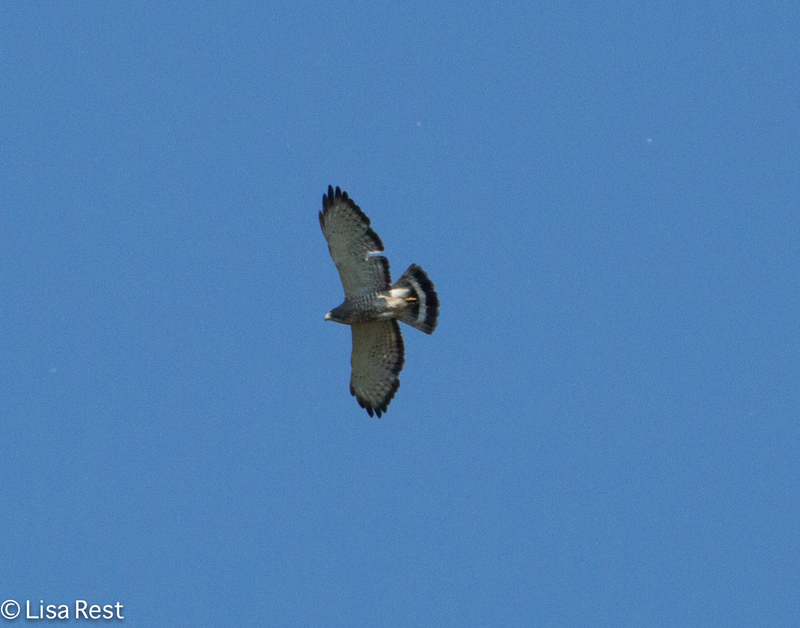 Not a great shot but the profile is distinctive. 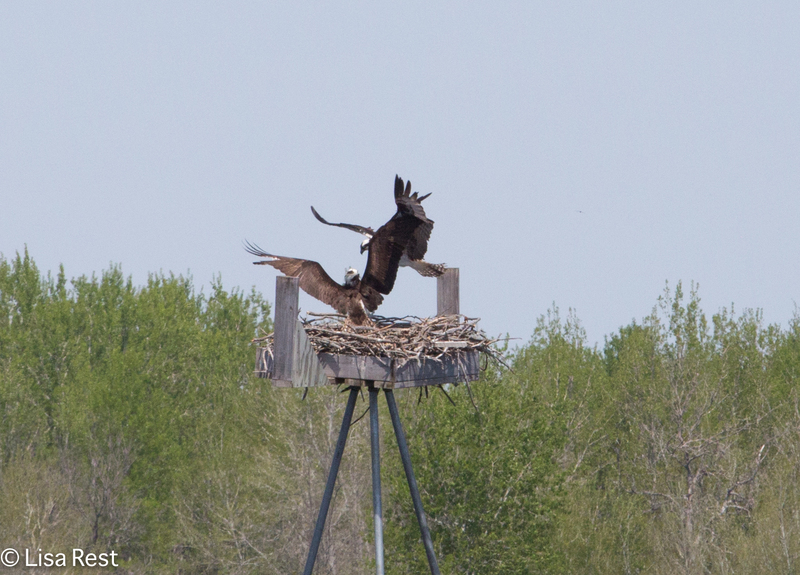 There is a viewing area across from the Osprey nest, where these pictures were taken. I can’t resist the “Honey, I’m home” sentiment to the last picture above although her reaction indicates that he forgot the milk. 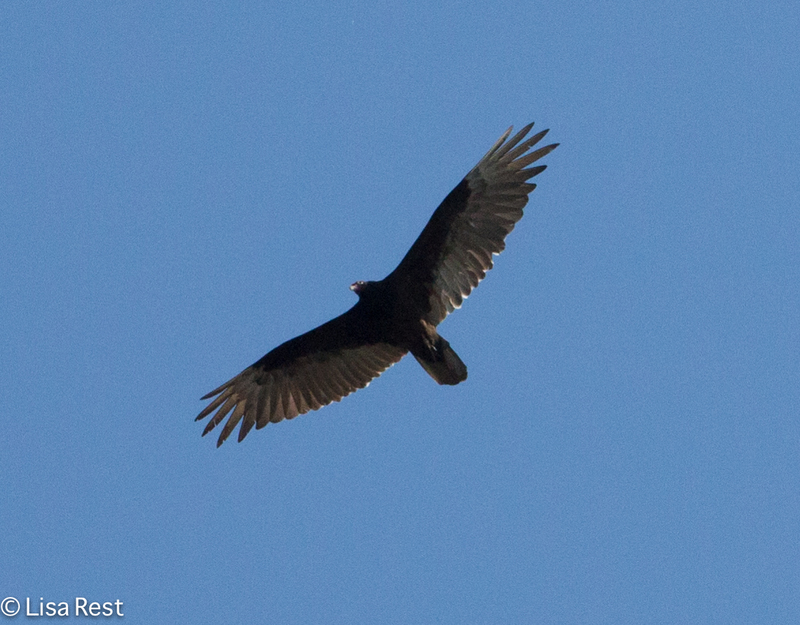 I never tire of seeing Turkey Vultures, even after being in Virtual Vulture Heaven about a month ago in Texas. I promise to get back to those pictures as soon as I am done with these! 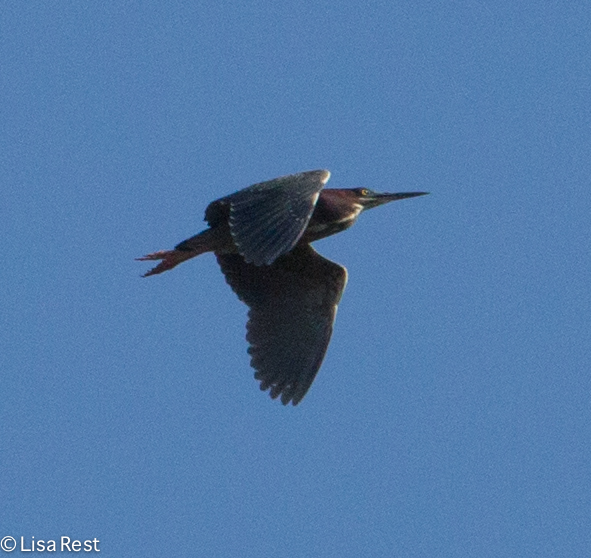 I can’t remember if we saw any Green Herons on the ground, but we certainly had them in the air (six!). 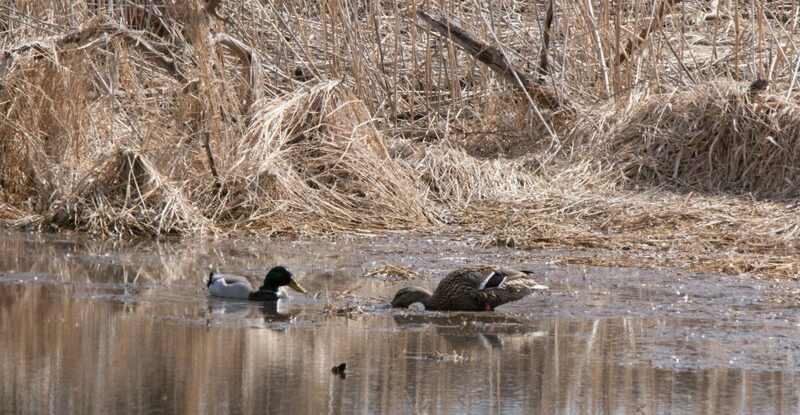 As I recall (memory being what it is two weeks later), we made some stops along the way to the Marsh and by the time we got there it was perhaps a bit later than we had been last year, mid-morning and a bit quieter. 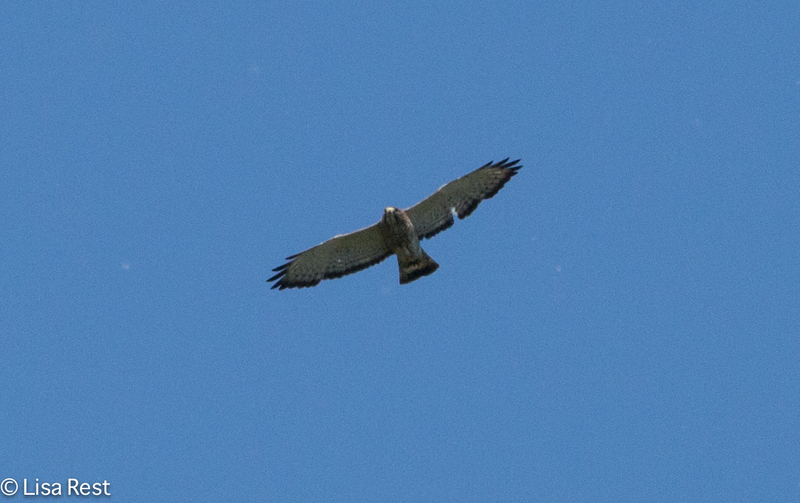 But we got great looks at a Broad-Winged Hawk that flew over. 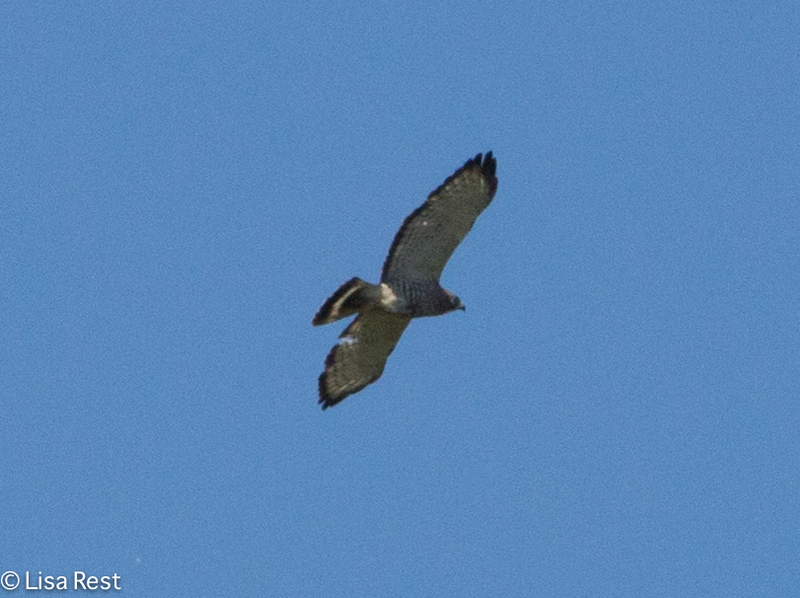 Below are my first-ever photographs of a flying Broad-Winged, which is a less-common buteo to see. I am thrilled to have these pictures to study and imprint on my brain, so I might be able to recognize the next one I see flying by, which will probably not hang around so long. We went back to Tuttle Marsh in the evening to hear, if not see, the American Bittern. We did hear one call once, but I did not manage to record it. 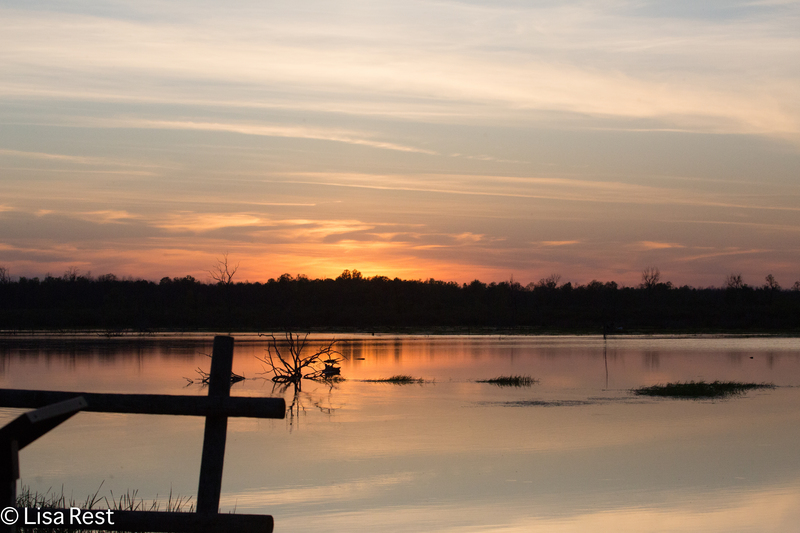 However while we endured swarms of mosquitoes that eventually subsided as the temperatures cooled, I did manage to get a picture of the sunset, and a recording of a very vocal Eastern Whip-Poor-Will.